I must excitedly yet sadly report that the mega project has come to an end. Excited because I have a great sense of accomplishment for this little baby; sad because my baby is all grown up. I kind of feel like an empty nester as odd as it sounds. Anyway, I digress; on with the tour! A, B, C) The main lobby where patience are greeted by the staff and checked in at the reception desk. 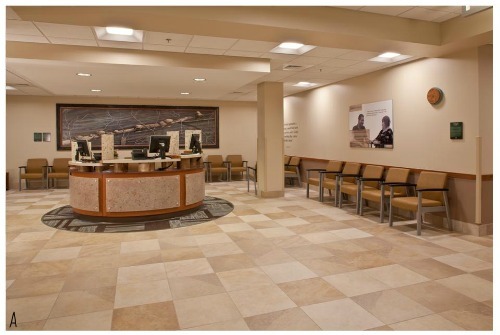 The lobby features a custom reception desk, gorgeous ceramic tile, an original painting by Brian Gordy, an original painting by Hattie Stanton, and pottery by Richard Tuck. There is also one of several groupings of Indiana Poplar logs looking rustic and lovely under LED lighting with a base of Tennessee River Slicks (grouted down by hand by yours truly - yes i do manual labor). 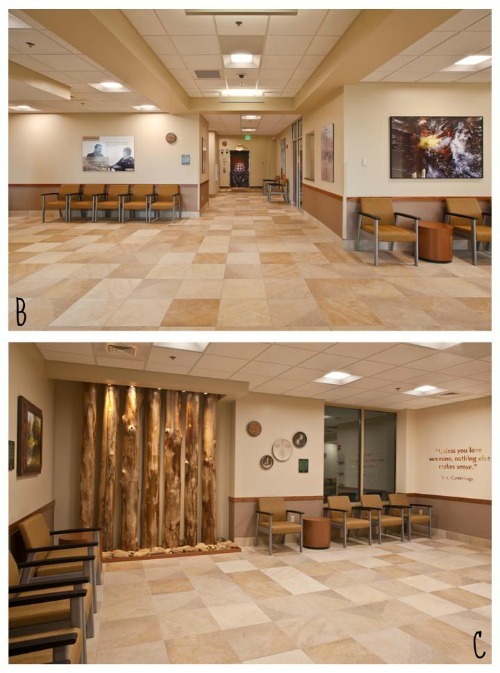 D) The long corridor of exam rooms can be found on the first floor in the primary healthcare area, the second floor pediatric and women's health area, and the urgent care wing. The south side of the building houses physicians offices with storefront walls that flood sunlight into the corridor. E) Administration on the third floor is home to the system furniture we scored from a re-seller at a great deal. Perfect condition and exactly the workstation we needed for billing, accounting, and support staff. 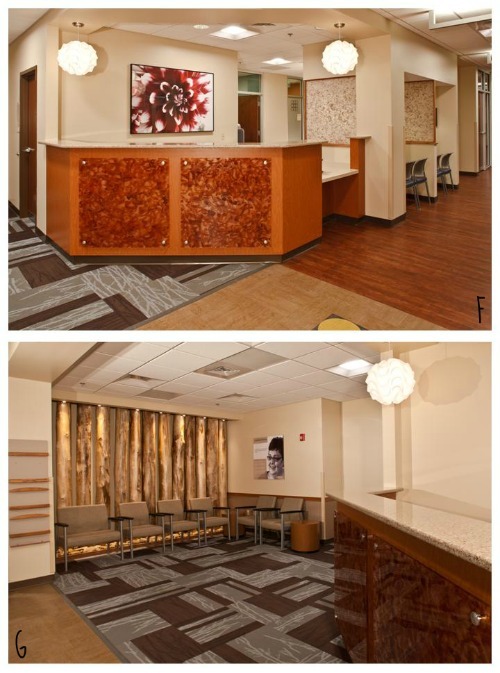 F,G) Off of the elevator on the second floor is the sub reception desk and waiting for WIC and dental patients. The pendant lights are from Lighting Universe and are called Meringue. How fun is that! The front of the reception desk features resin panels made of mahogany shavings made by Luxe + Natura. Panels retro fitted to divide check-out stations are called Paper Leaf made by Lumicor. H,I) Another sub waiting area on the second floor is specifically for pediatric waiting. A two piece original painting by Jim Faulkner occupies most of the walls. 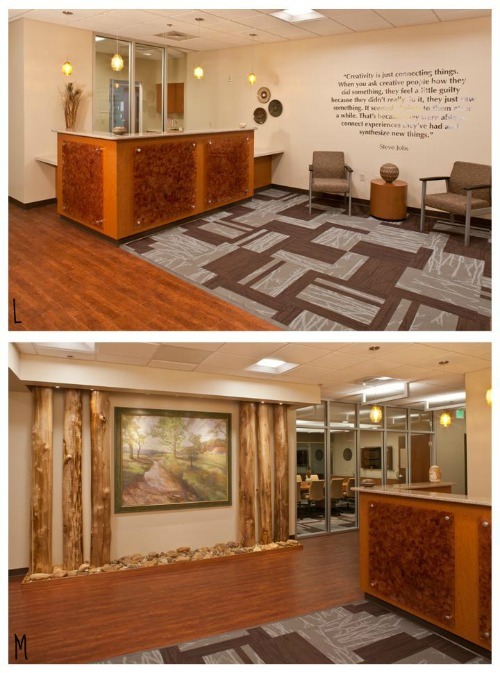 On the opposite wall a small grouping of logs with a custom bench, photograph by Kyle Evens, and a vinyl wall quote. J, K) The dental suite features Midmark cabinetry to house x-ray equipment and supplies. A suspended monitor hangs from the ceiling to easily share information with the patient. L, M) The third floor reception desk has Luxe + Natura panels and is lit with glass pendants from Lighting Universe. Poplar logs flank an original watercolor by David Dale across from a vinyl quote from Steve Jobs. A collection of ceramic plates are hung on the wall with bottles and vases atop the reception desk. N) The building 13 conference spaces including a community room that takes up half of the basement level. 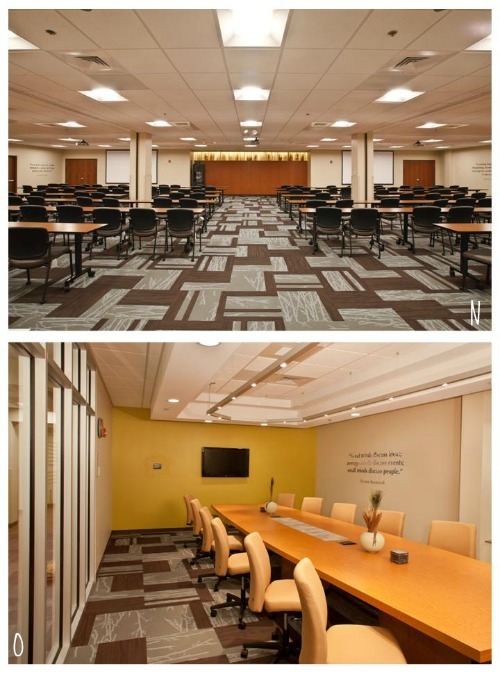 The room is home to 64 training tables and 128 chairs, a lighting and audio visual system controlled by an iPad, several inspiring wall quotes, and Modernfold panels that divide the large room into three smaller rooms. O) Another conference space is the board room on the third floor. This room seats sixteen people at a custom boat-shaped table with tile and technology inlays. A unique suspended fixture hangs in the center of the room that spreads up and down light by manufacturer Architectural Lighting Works. P) A large employee break room is also in the basement and features a unique tile product called Create by Mannington. Q) Have you ever seen a mechanical room this clean? It's pretty magical, not gonna lie. 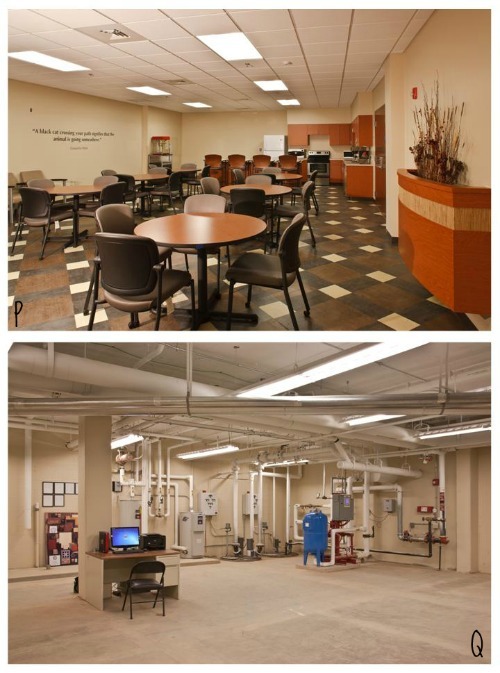 The mechanical room is the control room for the geothermal system, the dental compressor, the elevator controls, and the plumbing equipment. After spending two years of focused energy on this project, it's so strange to not start and end my day by checking in at the project site and meet with the contractors-turned-friends. [May or may not be tearing up! This project and the people it brought me to are close to my heart.] However, all good things must come to an end and I'm already started on new adventures that I can't wait to share. Thanks for your patience in this picture heavy post! GREAT job! This is a beautiful building. I'm glad I got to see it in person. chocolate on chocolate chip you know you are going to miss it. virtual tour is very good courtney. hope the new projects are as fun as this was! Everybody I know is afraid that nothing will happen, medical staffing that the money won't be forthcoming. They can't parole people fast enough to solve the financial hickey.